Originally a dairy farm, the land has been used for fruits, vegetables and grain in recent decades. During the years 1982 to 1983 there were fields of asparagus, strawberries and raspberries. The first blueberry bushes were planted in 1985 with additional plantings in the following years. 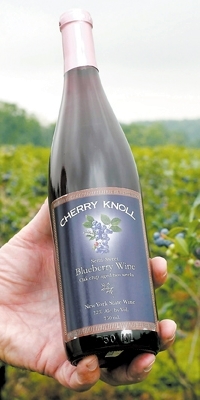 Currently Cherry Knoll Farm produces only blueberries. The 5.5-acre blueberry field has 10 varieties of blueberries and produces approximately 15 tons of blueberries annually. These blueberries are used for making 6 blueberry wines and blueberry wine vinegar. The blueberry field is also open to the public for U-Pick customers.